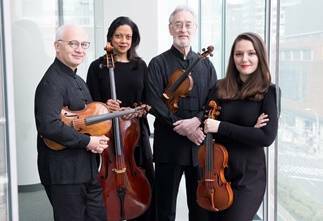 The Juilliard String Quartet—as much a (cherished) institution as a chamber ensemble—has seen its chairs occupied by over a dozen different members throughout its storied 73-year history, and Wednesday evening was my first encounter with the current line-up as such: when last I heard the Juilliard in concert barely five years ago, the current first violinist and cellist had not yet joined. What has not changed with the replacement of two chairs is an ability to summon a technical command that is impressive whether or not one is entirely taken with the interpretation of the work at hand. In the Haydn quartet that opened the program—his last quartet, barring the fragments that would eventually be published as Op. 103—this showed itself in a reading marked by linear clarity, constant alertness, and a strong grip on the music. However, one could argue that this grip was rather too strong as times; I often wished for a touch more relaxation, warmth, and expressive variety. Given this basically straightforward approach, I found perhaps the most enjoyment in the third-movement andante, arguably the work’s centerpiece. Astrid Schween brought an appealing lightness of touch to the cello’s extended statement of the lovely main theme toward the end of the movement, a welcome contrast to the somewhat high-strung quality of much of the ensemble’s performance; and the movement’s quiet conclusion was brought off quite effectively as well. Furthermore, in spite of my quibbles about interpretation, I could not help but be impressed at the extremely clean articulation of the fast runs in the finale. In Goethe’s often-quoted expression, the string quartet is “four rational people conversing among themselves”; for all the stark expression of which it is capable, at its heart a civilized genre. Beethoven may push this paradigm to its limits, not least in his latest works, but Bartók more or less tosses it out the window, treating accented dissonance and grating sonorities not merely as occasional effects but as fundamental elements of the musical syntax. Now I do not adhere to the “eat your vegetables” school of musical appreciation in such matters, and so I am never likely to become a true believer in Bartók; yet in all fairness I must admit: unlike (as it so often seems) his army of latter-day imitators, he knew how to incorporate his aforementioned elements of musical syntax into a work with an overall shape and sense of linear motion, perhaps especially in the relatively terse Third Quartet. Here the Juilliard Quartet’s great emphasis on polish and linear clarity helped to bring out the underlying classical poise and structure, creating a through-line that helped the listener follow—“enjoy” is probably still too strong a word here—Bartók’s musical argument. A much earlier incarnation of the Juilliard recorded a famous set of the complete Bartók quartets in the early 1950’s; it seems that today’s ensemble still keeps the flame. In the Beethoven Second “Razumovsky” Quartet that closed the program, the ensemble displayed (at least initially) an approach similar to that taken in the Haydn, alert yet highly controlled. Such a serious approach is ostensibly better suited to Beethoven than to Haydn, yet even here I longed in the first movement for an extra touch of flexibility of phrasing, of a sense of spontaneity. The second movement molto adagio remained somehow earthbound, in spite of all its beauties—not least of which was, again, the sensitivity of cellist Astrid Schween. Fortunately, however, in the final two movements I sensed an extra degree of inner life and that much less sheer tenseness, notwithstanding some studied phrasing from first violinist Areta Zhulla in the third-movement allegretto—really a standard-issue Beethoven scherzo—and the concert ended on a high note.